Refer to the individual Bracelet Size Charts below for standard fashion industry bracelet sizes for children, bracelet sizes for women and bracelet sizes for men. These average bracelet sizes are perfect for general purposes, but if you would like to determine bracelet sizes more accurately then follow the instructions provided further down this guide. With child bracelet sizes it is a good idea to add a 1″ or 2.5 cm extension chain to the bracelet to allow for continued growth. 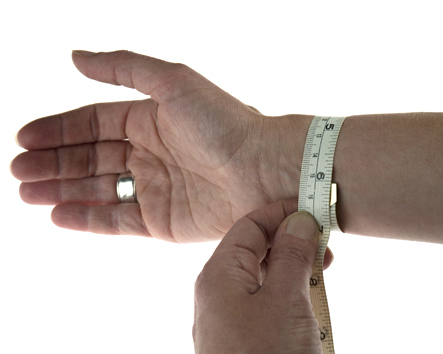 Measure the circumference of your wrist by wrapping a flexible tape measure around your wrist at a point just below the wrist bone. Then read off and record the measurement. 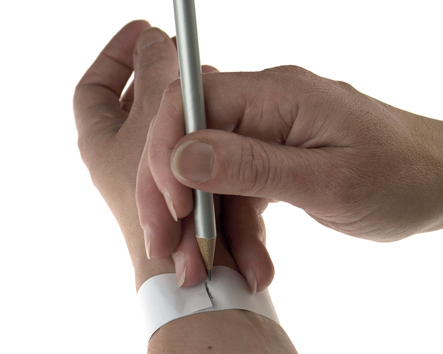 Alternatively wrap a thin strip of paper around your wrist just below the wrist bone and mark the paper where it overlaps with a pencil. Then measure the paper strip up to the pencil mark with a ruler and record the measurement. For bracelets with a magnetic clasp the bracelet size can be made a little smaller than similar bracelet designs with other types of clasp. With a magnetic clasp being far easier to remove than, for instance a toggle clasp, you can subtract a 1/4” or 0.6 cm from your measurements.